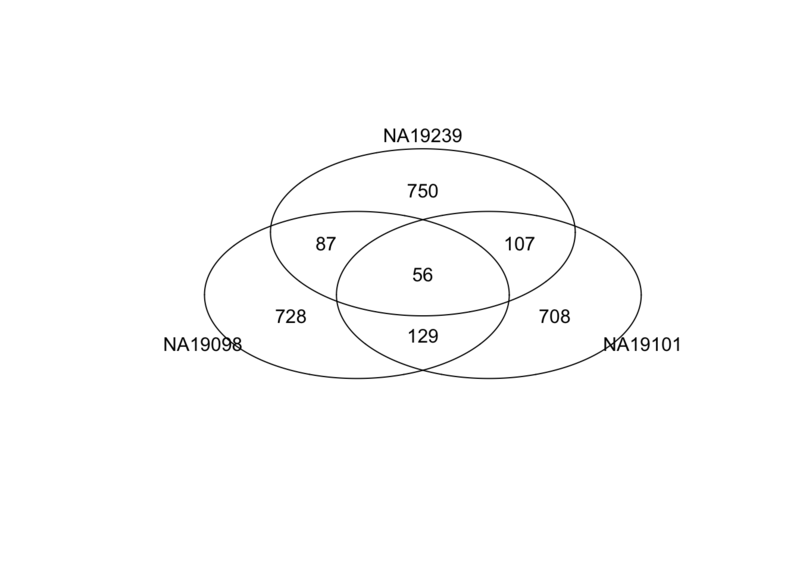 In this document, I will outline and consolidate results of biological variation analysis. Import molecule counts for genes with at least one observed read (before QC filtering). 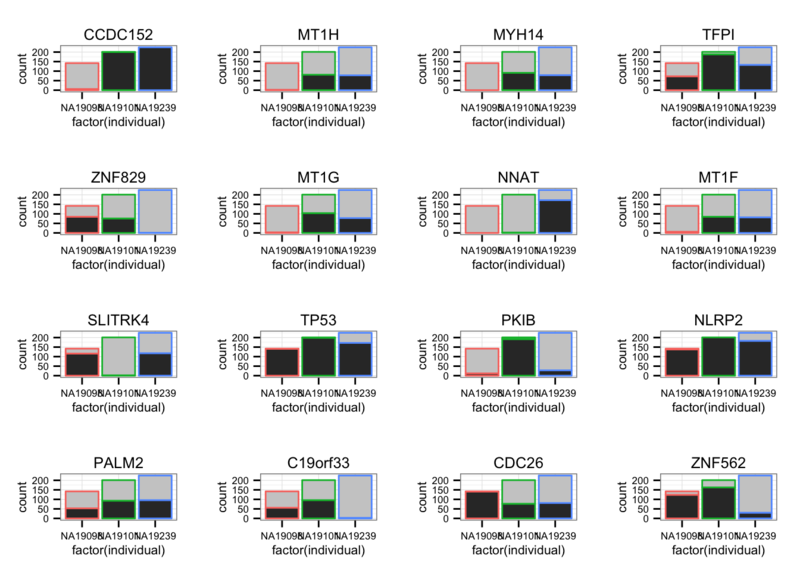 Import final processed molecule counts of ERCC genes. 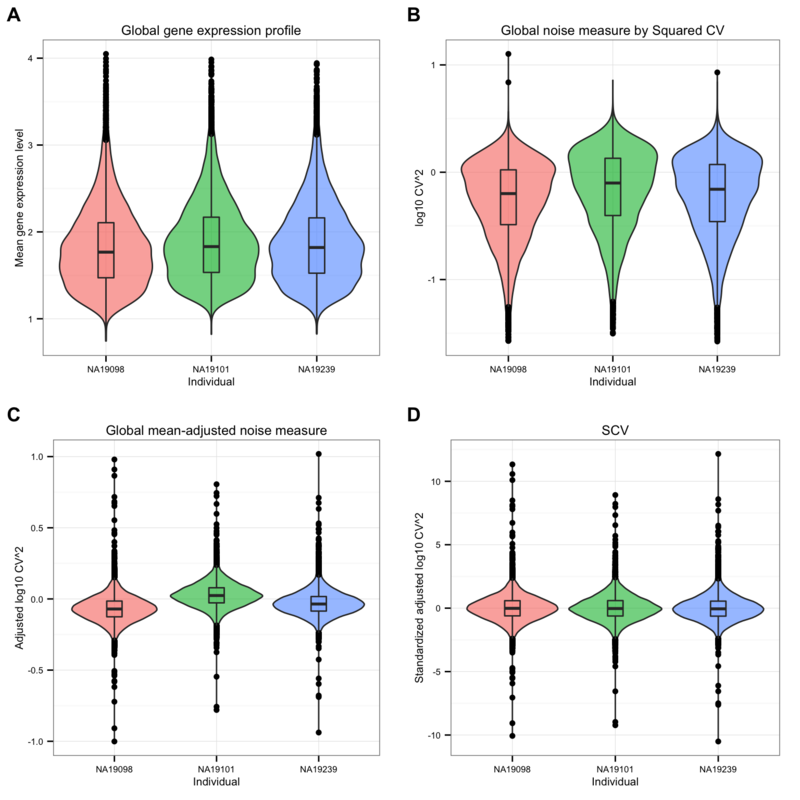 Plot for each individual CV versus mean. Mark ERCC genes. 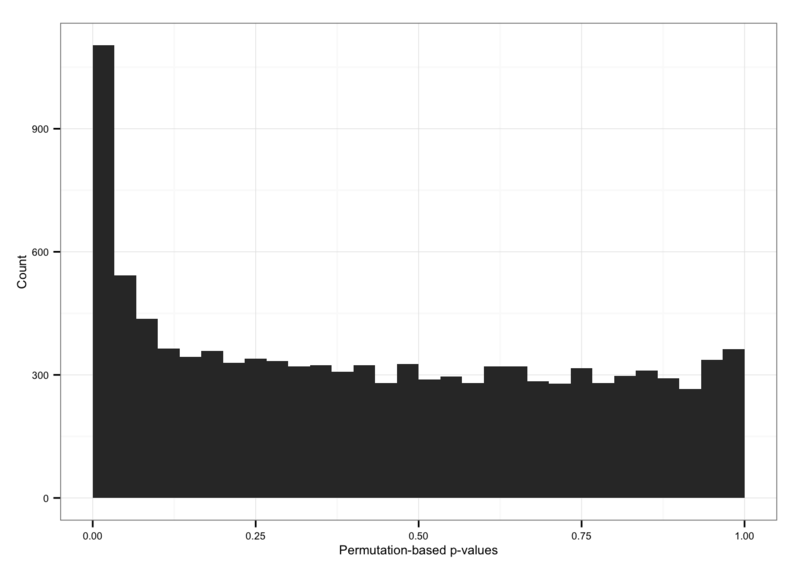 Fit a poisson distribution based on the ERCC genes and overlay the fittedn line. ####   dont use the points from ERCC.mol.mean < 0.1 to fit. 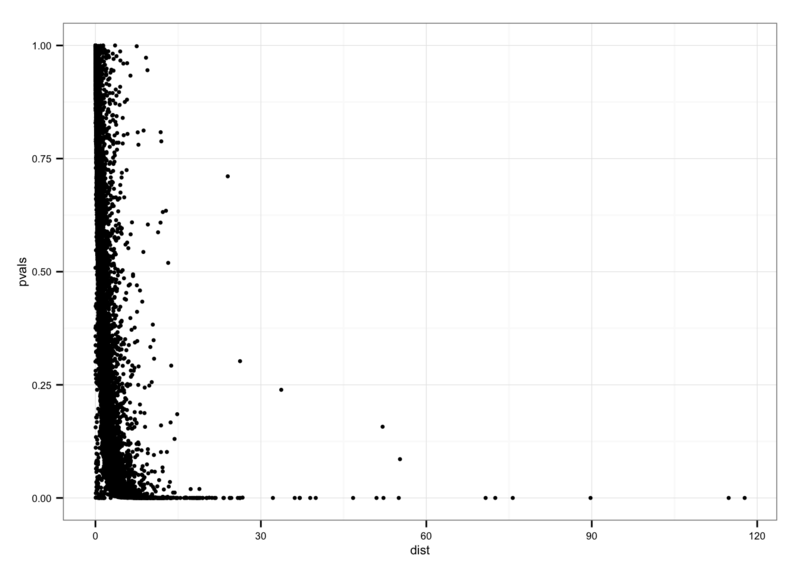 Per gene density plots of large distances. 34 ERCC genes left after filtering. 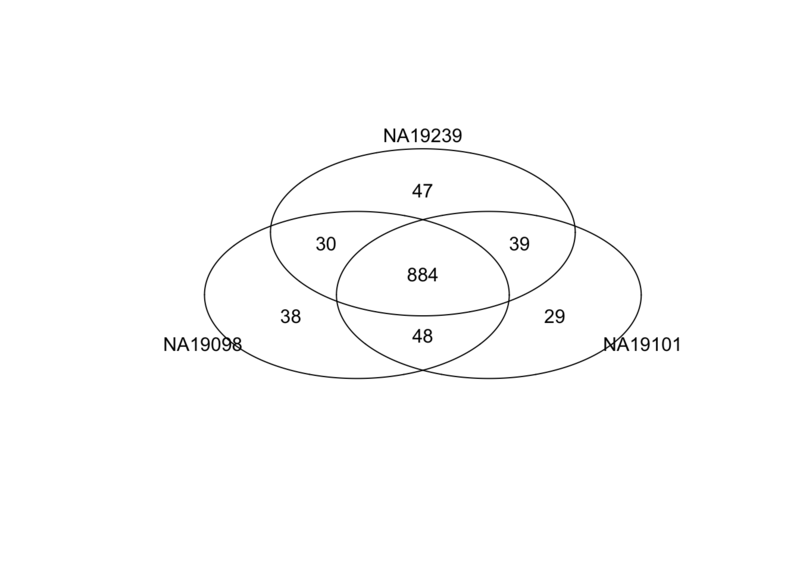 Points marked blue are ERCC genes, based on the observed counts. 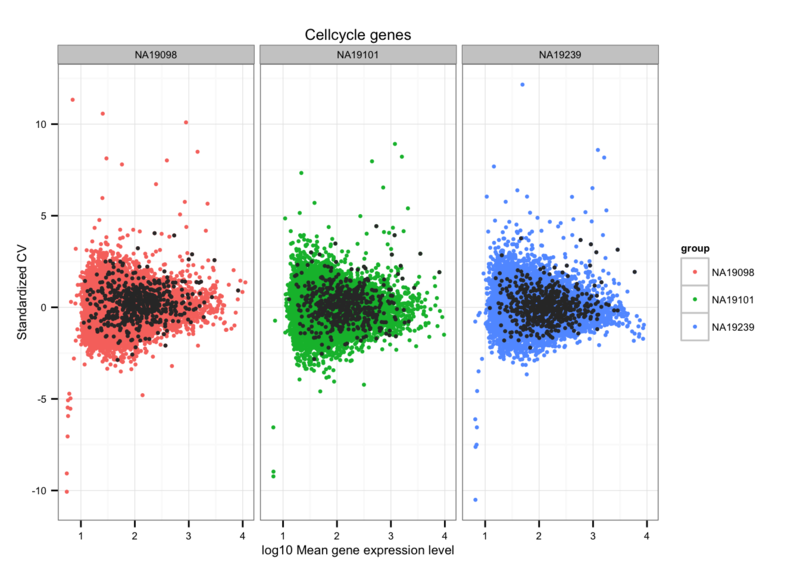 Note that CPM correction for the endogeneous genes included only total molecule coutns of the endogeneous genes, and CPM correction for the ERCC genes included only total molecule counts of the ERCC genes. 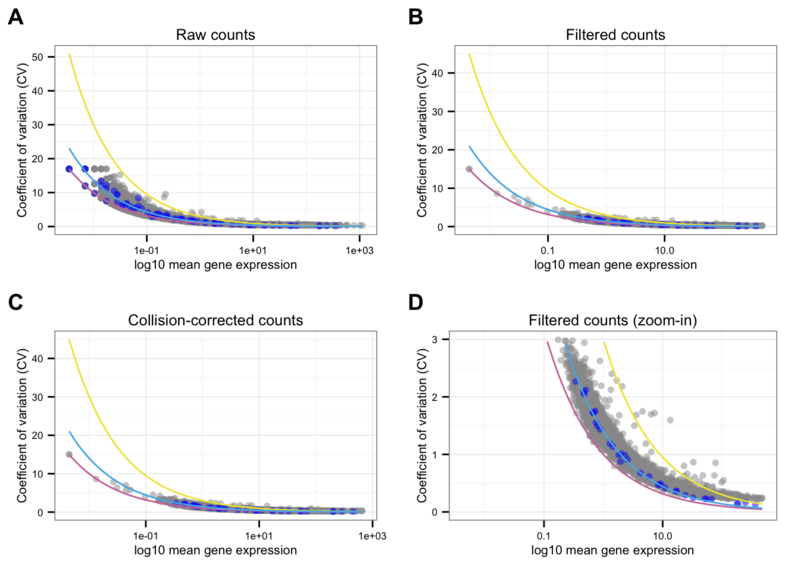 Because the total molecule counts of the endogeneous genes is about 100 times of the ERCC genes, the CPM corrected ERCC counts end up being 100 times of the CPM corrected endogeneous genes on average. 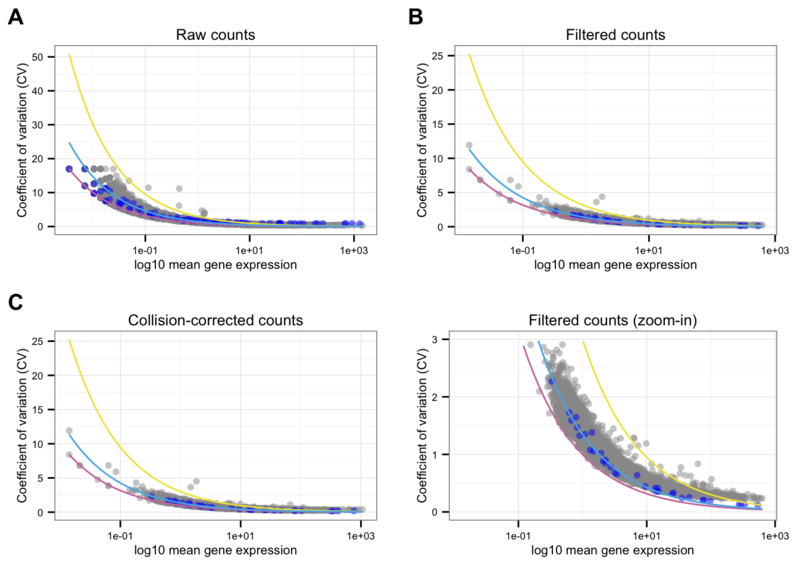 Blue line is the lossy Poission line predicted based on ERCC genes. Pink/Purple line is based on Poisson distribution. Yellow line describes a 3 times of the standard deviation of a Poisson distribution. Standardize the adjusted Squared CV across each individual’s mean and standard deviation of adjusted CVs. Load functions to compute and to adjust CVs. Adjust CVs for mean dependency. CV before versus after adjustement. 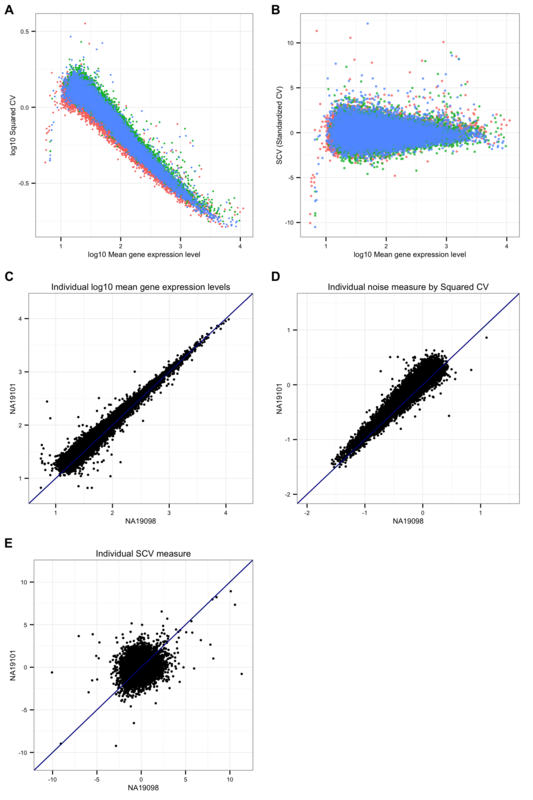 Top 1000 genes based on Standardized CVs. 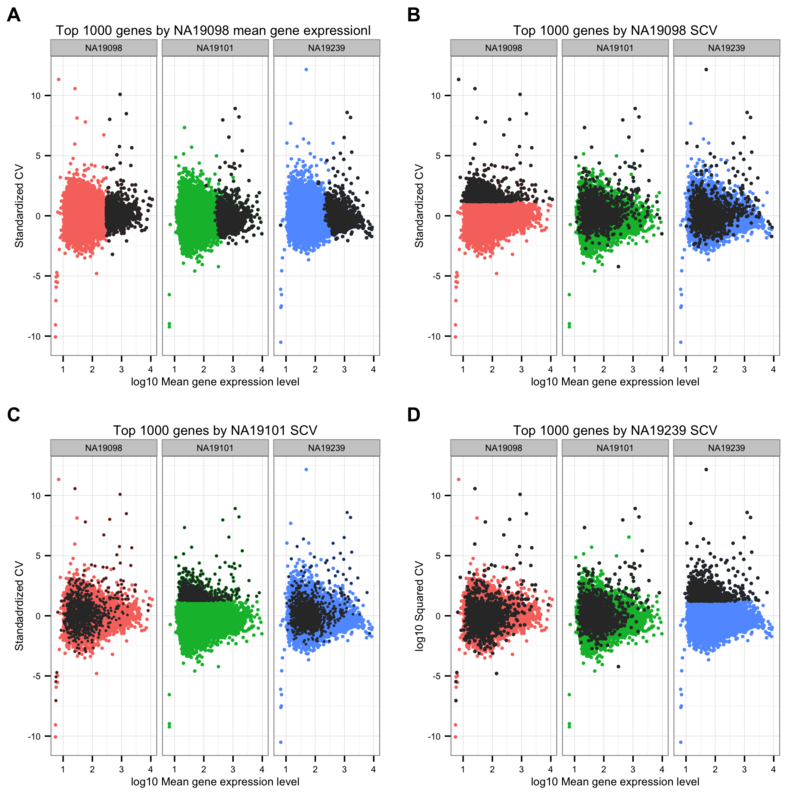 Mark top ranked genes based on individual standardized CVs. 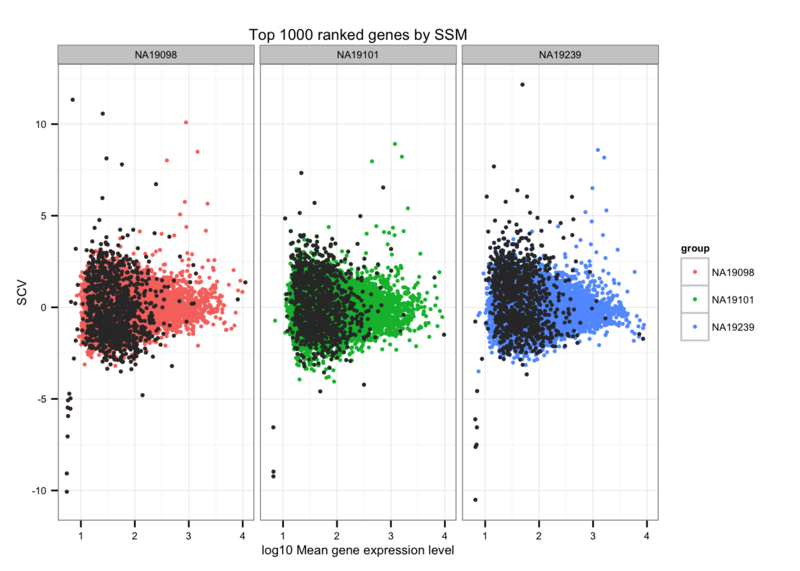 Top 1000 ranked genes by SSM. 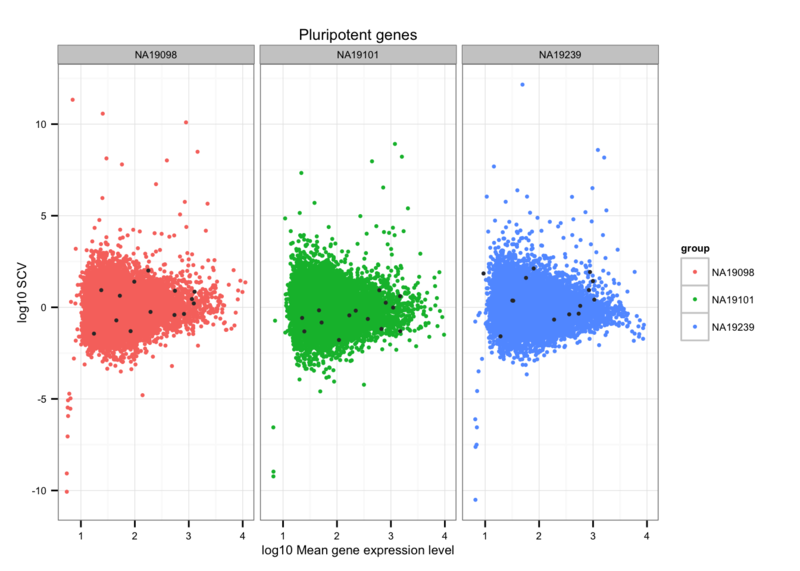 Make a data.frame for all genes tested including permutation-based p-values, SSM (Sum-of-the-Squared-Deviations-From-the-Median), ENSG IDs, and gene symbols. For each individual, count the number of zero count cells and the number of non-zero count cells.